Beautiful installations don’t just happen. 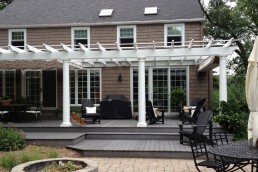 They usually involve a lot of consideration on the part of the homeowner to ensure that the details are not overlooked and the results deliver what is expected. 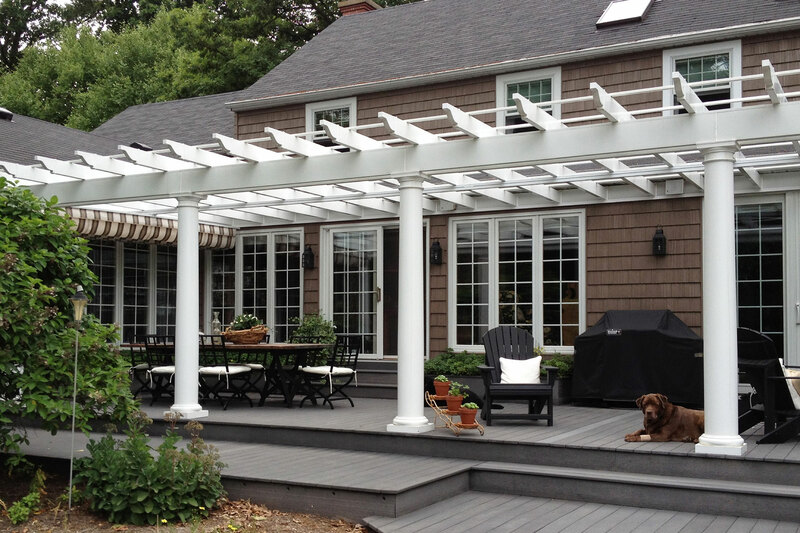 This beautiful home in La Porte, Indiana was challenged with a southwest facing porch that was too hot to enjoy when the sun was out, and too wet to enjoy when the temperature was just right but the day was interrupted by a light summer rain shower. 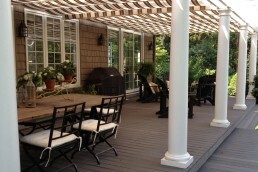 The homeowner decided sun and rain protection was needed over the porch and found ShadeFX in an online search. We received a set of photos that revealed an area to be covered that was very long. 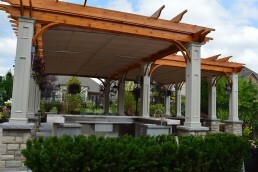 In addition, the tops of the windows and doors were close to the underside of the pergola rafters. 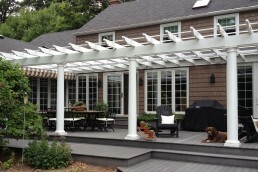 This confirmed the need for the canopy to be installed operating parallel to the home so the folded canopy, when retracted, would not cover any part of the glass area. At thirty-seven feet long, a motor drive is usually required in order to properly extend and retract the canopy. However, the option of two canopies operating on a common track was proposed and accepted as a more appealing solution. We call this ‘kissing canopies’. The first benefit of kissing retractable canopies is the ability to cover a long and large area with multiple manual canopies rather than one motorized canopy, saving money. 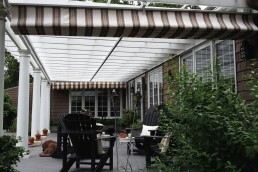 The other is to have the flexibility of operating each canopy over its area of coverage, independently. It’s a popular choice and highly recommended for long areas to be covered. 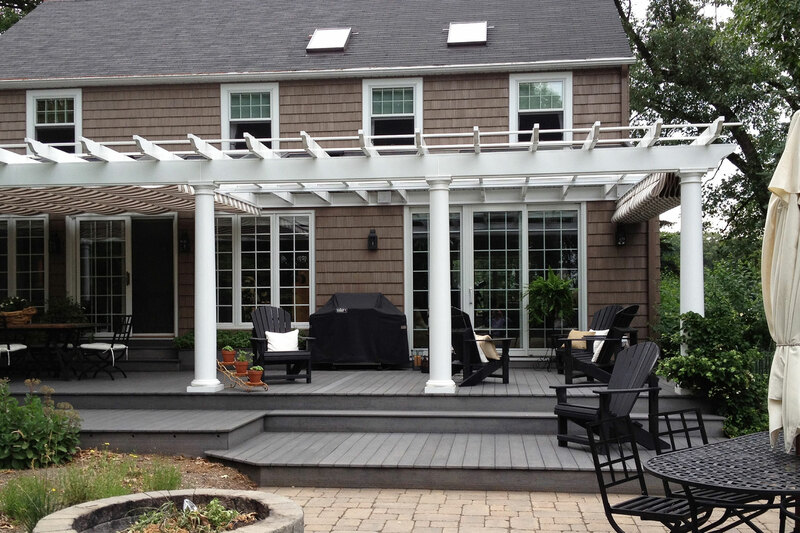 This beautiful home in La Porte, Indiana was challenged with a southwest facing porch that was too hot to enjoy when the sun was out, and too wet to enjoy when the temperature was just right but the day was interrupted by a light summer rain shower.